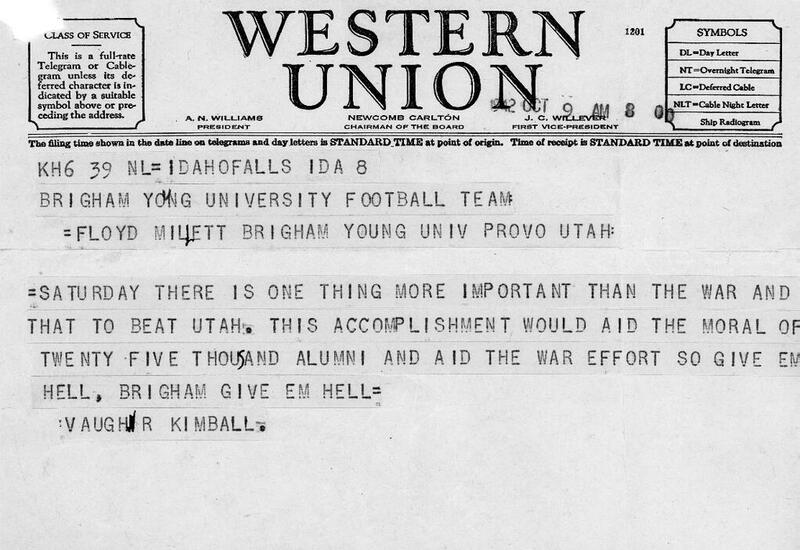 The above Western Union telegram reminding the Cougars to "Give 'Em Hell" was sent on October 9, 1942, from Vaughn Kimball, a former BYU quarterback who left school in 1941 to join the Naval Reserves. According to his obituary, Kimball was a star athlete in football and basketball at both Jordan High School and Provo High School, and was killed May 11, 1945, while serving on an aircraft carrier in the Pacific. Kimball's message must have worked because, coincidentally, 1942 was the first time in the rivalry's history that BYU beat the Utes, in a final score of 12-7, at Utah. And, as Kimball predicted, the BYU victory aided the war effort and the Allies eventually won the war.